Since the typical gym setting is not ideal for many people who are looking to exercise with a personal trainer, we offer real private training at the studio. We have private personal training stations where each session occupies its own private training space. Each private training room is equipped with state of the art fitness equipment. Our studio offers nutrition counseling services with our Registered Dietitian, and we are also adding small group fitness training classes for adults and children. Steve (tfitstudio's owner) struggled with childhood obesity from the age of 8 to his early teenage years. The day he decided to change his lifestyle, began a journey that resulted in an over 100 lbs. weight loss. 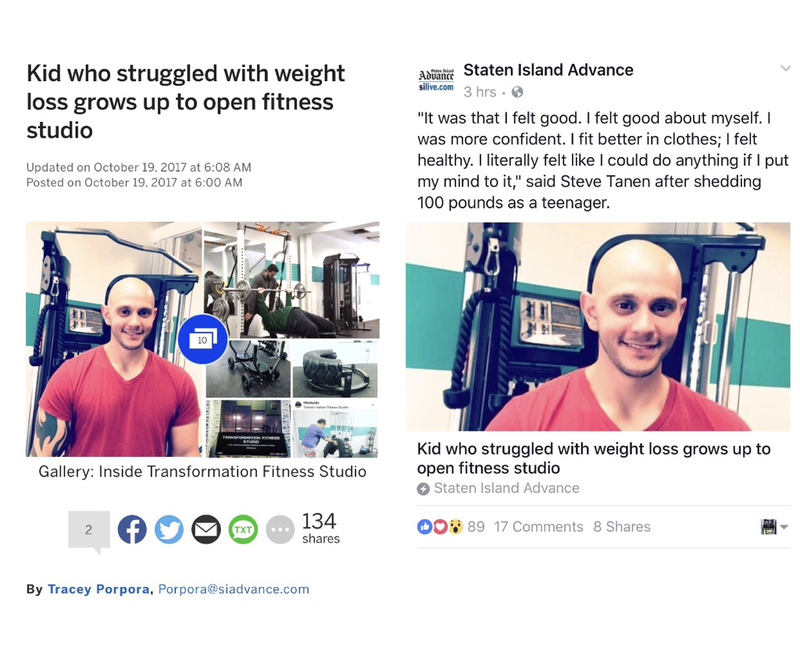 Steve created Transformation Fitness Studio in 2008, a place that is dedicated to helping clients reach their own desired fitness goals and aid in improving clients' overall health and wellness. Steve is a major advocate for healthy lifestyle changes. He believes that the promotion of fad diets are an issue that plague the fitness industry, and these fads can be physically and mentally dangerous and addictive to consumers. Steve, as well as the entire TFit Team, believe that hard work, self control, and dedication are the greatest predictors of goal success and acheivement They all believe in the idea that in order to lead a healthy lifestyle and accomplish your goals, you must "strive for progress, not perfection".